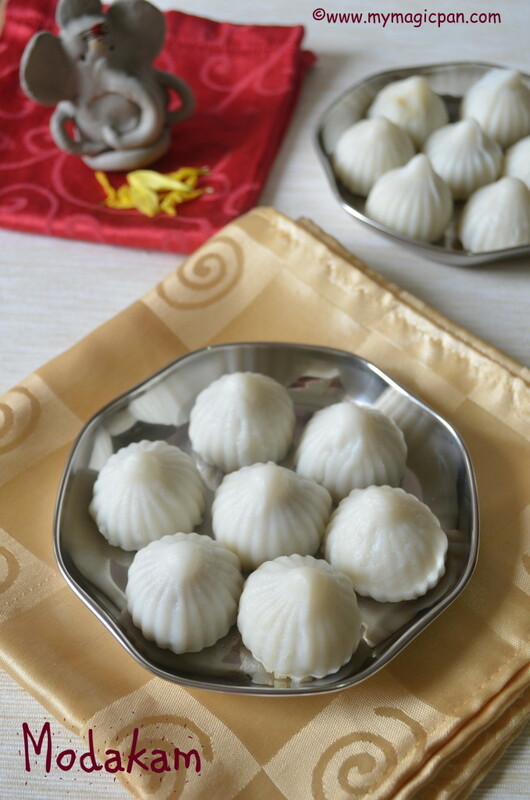 This Mothagam with Kadalai Paruppu Pooranam is the trademark recipe in every household for Pillayar Chathurthi. 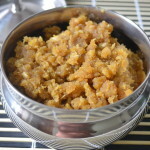 On the day I make Chickpeas Sundal, this mothagam or Mothagam with coconut pooranam and Ellu Urundai. Sometimes Medhu Vadai would also be in the list. 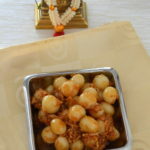 So I usually end up making the pooranam the previous day so that it is quite easy. 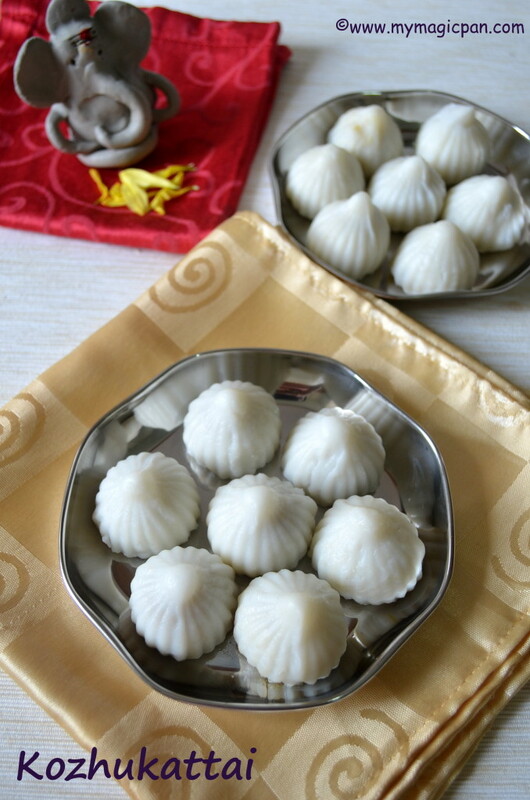 I tried making the Mothagam with a mould that I got from India. This is really handy, especially for beginners who find it difficult to shape the Mothagams. 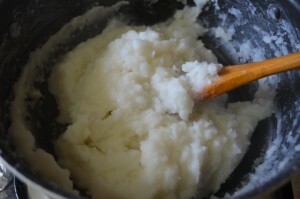 Heat a pan and dry roast the rice flour just until it is warm without changing its colour. Keep it aside. 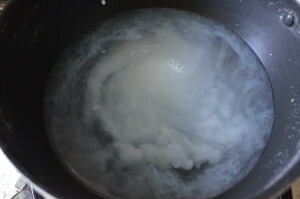 In the same pan add 2 cups of water, oil, milk and salt. 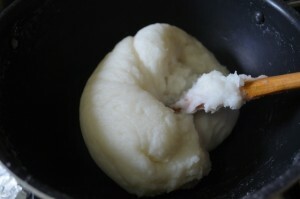 Bring it to a boil, simmer and add the dry roasted rice flour, stirring simultaneously. It will become thick very quickly, so keep stirring in low flame. 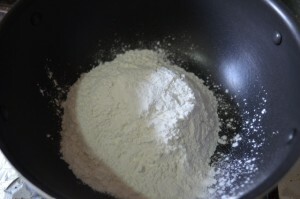 Mix until it rolls up into a smooth non-sticky dough. This will only take a few minutes. Switch off the flame and keep it covered with a wet muslin cloth. Make small balls from the dough. 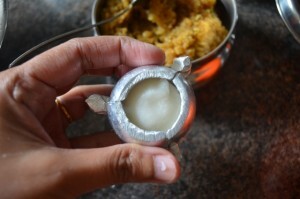 Grease the mothagam mould with oil and place the ball in it. Now make a hole in the centre and press the dough towards the inner walls of the mould. 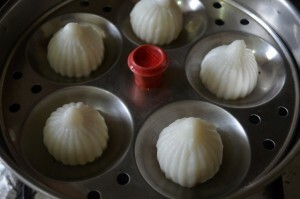 Place a poornam ball inside the hole. Finally take a small bit of dough and seal it so that it covers all the sides/edges. 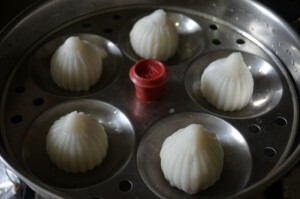 Open the 3 sides of the mothagam mould and take the mothagam carefully. Continue the same with the rest of the dough. Meanwhile, heat a idli cooker with water. 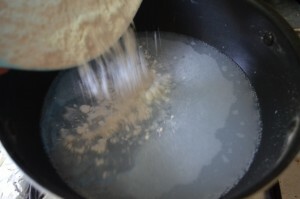 Steam cook the Mothagams for 7-10 mins. U will be able to see that it looks shiny. Once it cools transfer it to a bowl. Thats it!! Mothagam with Kadalai Paruppu Pooranam is ready!! Keep the Poornam ready before u start shaping the Mothagam. 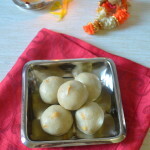 In fact, making balls of the dough and the pooranam would be even easier. 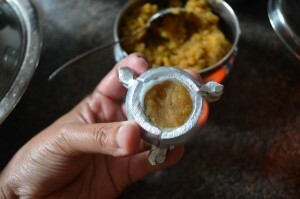 I usually keep a bowl of water + oil handy while shaping the Mothagam. 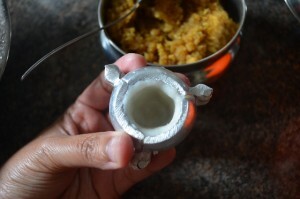 U can grease the mothagam mould with this everytime if u find it difficult to get the mothagams. Make sure to keep the dough covered, else it will dry up. 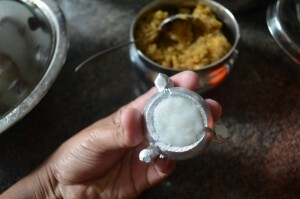 Adding a tbsp of milk helps to prevent the cracking of Mothagam. 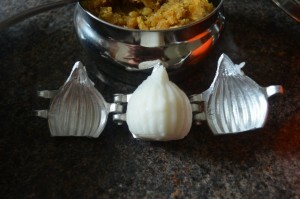 Do not overcook the Mothagam, else it will become hard and rubbery. 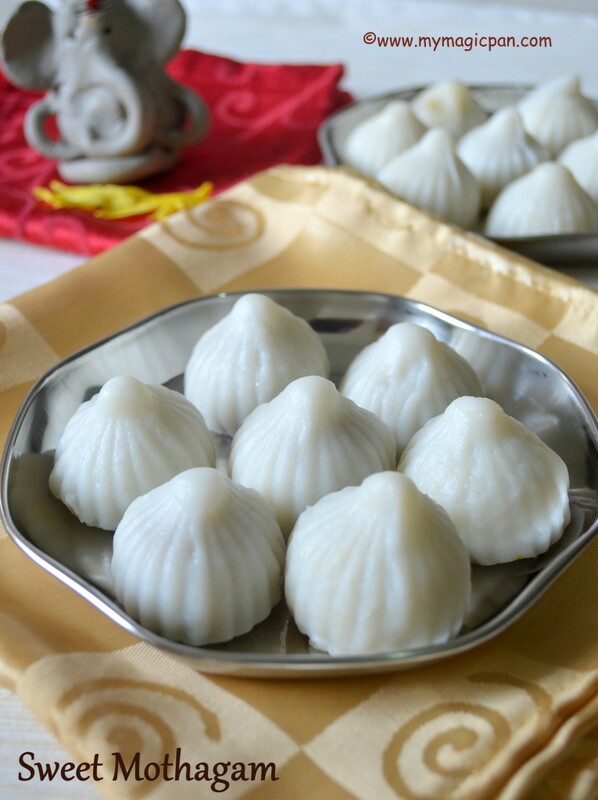 There are a lot of mothagam moulds available. U can chose whichever u prefer. As far as I know, the concept would almost be the same though. If u do not have a Mothagam mould, check this video which I posted last year about shaping the Mothagams!! 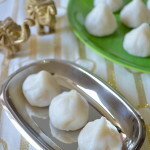 This one is with Coconut Pooranam!! Kadalai parippu pooranam mothagam super sundari. 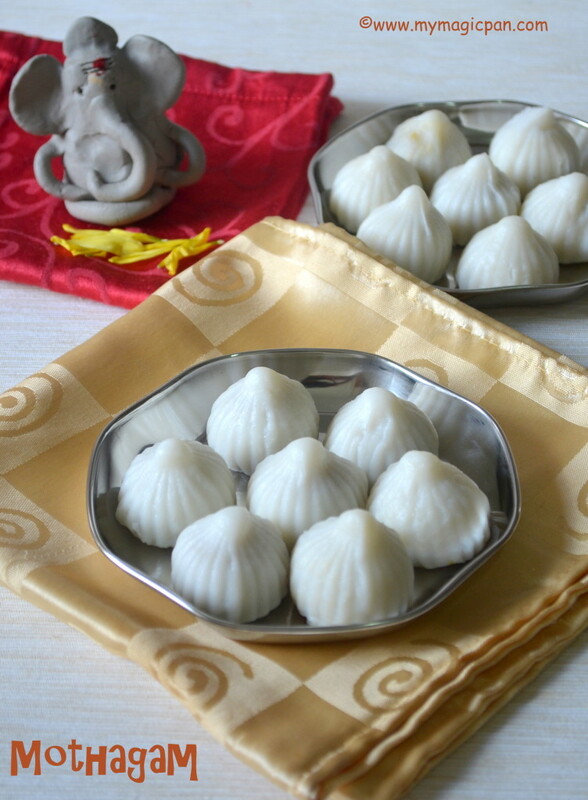 These modaks look super yummy. Perfectly made!